Daphne Caruana Galizia was a prominent journalist and government critic. 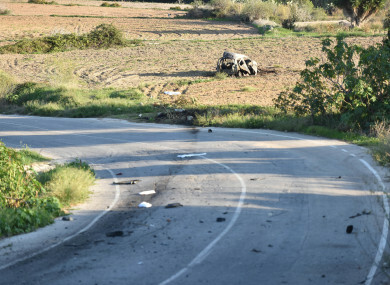 The wreckage of the car of investigative journalist Daphne Caruana Galizia lies next to a road near the town of Mosta. DAPHNE CARUANA GALIZIA, a prominent Maltese journalist and blogger who made repeated and detailed corruption allegations against Prime Minister Joseph Muscat’s inner circle, has been killed by a car bomb. Muscat condemned yesterday’s killing as a “barbaric” act and ordered security services to devote maximum resources to bringing those responsible to justice. “What happened today is unacceptable on various levels. Today is a black day for our democracy and our freedom of speech,” he told reporters. Caruana Galizia, 53, died mid-afternoon, close to her home in Bidnija in the north of the island. The force of the blast reduced her car to pieces and catapulted the journalist’s body into a nearby field, witnesses said. She leaves a husband and three sons. Thousands of people, holding candles and waving placards, poured into the streets in the island’s northeast resort town Sliema for a candlelight vigil to pay tribute to the reporter. People left candles, flowers and messages of support at makeshift shrines in the street. “When the people fear their government there is tyranny, when the government fears the people there is LIBERTY,” read one sign left on the pavement with flowers and candles. A local television station reported that Caruana Galizia had filed a police complaint earlier this month about threats she had received. “I will not rest until justice is done,” said Prime Minister Muscat. “Everyone knows Ms Caruana Galizia was a harsh critic of mine, both politically and personally, but nobody can justify this barbaric act in any way,” he added. Caruana Galizia’s death comes four months after Muscat’s Labour Party won a resounding victory in a general election he called early as a result of scandals to which Caruana Galizia’s allegations were central. Muscat, premier since 2013, went to the polls a year early after his wife, Michelle Muscat, was accused of being the beneficial owner of a secret Panama bank account. Caruana Galizia had alleged the account was used to stash kickbacks from Azerbaijan’s ruling family linked to an Azeri bank gaining a licence to operate in Malta. Muscat called the claims the “biggest lie in Maltese political history,” asked a magistrate to investigate and has vowed to quit if any link is established between him and hidden offshore accounts. The premier has not applied that principle to two of his closest allies. Chief of staff Schembri and government minister Konrad Mizzi were both revealed last year to be owners of undeclared shell companies established through Panama law firm Mossack Fonseca. Muscat has stood by both of them. Muscat, 43, is a former journalist who won plaudits for his polished performances at the helm of Malta’s presidency of the European Union in the first half of this year. He won power in 2013, ending the 15-year rule of the conservative Nationalist Party on a pro-growth and socially liberal agenda. In his first term, he enacted legislation introducing gay civil unions and presided over a construction and tourism-based economic boom that analysts say won him the June election. Some of the corruption allegations that have swirled around his administration are related to a scheme under which wealthy individuals can acquire Maltese passports in return for investing in the island. There are also suspicions in other European Union countries that the island’s financial services sector is facilitating tax avoidance. German tax authorities is currently investigating some 2,000 Malta-registered companies with links to German corporations. Email “Investigative journalist killed in Malta car bomb ”. Feedback on “Investigative journalist killed in Malta car bomb ”.